Click here to check out more 42.2 featured content. Rhiannon Thorne currently resides in Southern California where she is the managing editor of cahoodaloodaling and an associate interviewer for Up the Staircase Quarterly. Rhiannon’s poetry has been published in Midwest Quarterly, Foundling Review, and The Doctor T. J. Eckleburg Review, among others. BWR: On the idea of different subjects, the parts of this poem that describe those extra subjects seem to me to be coming from a narrator on a TV documentary about vicuña or Sherman Adams, while the lines directly from the speaker of the poem have a more playful voice. Did you imagine multiple voices when you wrote the piece? What was your approach to finding the right voice for the different parts of this poem? As a whole? RT: I feel that there’s something incredibly creepy about placing seemingly innocuous objects, sayings, history, etc., into a poem about an incredibly delicate subject. I like the contrast and I’m sarcastic by nature. Here, I wanted to loosely thread several ideas together with a very flat, narrative voice to contrast with the speaker’s voice. Throughout most of the manuscript, the speaker’s voice is firmly in charge of the movement of the poem, almost obsessively so, with few deviations. There’s another poem in the manuscript I wrote much earlier, with another second-person narrator instead of this ‘speaker’; “Dead Baby Joke” was based on the popularity of ‘dead baby jokes’ when I was growing up. Not surprisingly, I suppose, I had a hard time placing it. This time, I wanted to write a poem which wasn’t critiquing a dark joke, but something that was as seemingly innocuous as the objects I was placing into it. Less sardonic, more tongue-in-cheek. Something more sunny-side. Sally Keith’s “Knot” (from The Fact of the Matter) was a huge inspiration for the formatting. BWR: Another energizing force in this poem is the unit of the line, especially the end-stopped line (only two lines the whole poem aren’t end stopped). How and why did you make the choice to lineate the poem in this way? Did those two line breaks you did add feel super risky? If so, why where they important enough to keep? RT: Generally I play it by ear, reading lines to myself over and over until I’m sure I ‘hear’ where they should break. In this case, I am indebted to Sally Keith for her formatting. The lines in “Knot” are mostly end-stopped, but she does have a few lines which aren’t. Some ideas, or one-liners, really transfer into multiple lines on a page, and seeing how Keith had pulled it off, I thought I’d try my hand. It was important to me to make sure each line which didn’t end-stop would end on a word with an idea central to the poem or collection. For example, “Times,” comes directly after the marsupials carrying children twice, and “handsome,” of course contrasts the idea of spinning handsome thread to the hope of having a handsome baby. BWR: Where do you go or what do you do when you are looking for inspiration but don’t feel like reading? RT: Going out and having experiences is a great way to expand the bank of knowledge I can pull from, but I generally don’t write when out and about. Usually that comes later when I’m reflecting, which I happen to do best when listening to music, so there’s a lot of Pandora. I’ve currently been writing to my dubstep station, which is weird and new, but generally I put on my Tom Waits or Dylan/Cash stations. Or sometimes I cheat and listen to audiobooks. Black Cake Records puts out some great poetry. BWR: What is your last favorite book you read? RT: For poetry, the chapbook Dear Turquoise by Ruth Foley. But if we’re going with full length, then the novel Hallucinating Foucault by Patricia Dunker. BWR: What lies in your writing future? RT: I have a hard time picturing my writing future past a few years. So far, my experiences with writing have relied so much on where life has taken me and with other poets and writers I interact with on a regular basis. I would like to go to grad school and get that MFA experience. I have a couple of manuscripts I’d like to workshop. My English degree is geared towards secondary education and did not include creative writing classes—I was busy learning pedagogy, California education laws that I’m sure aren’t even in place anymore, and grammar. Long term, I would like to work in publishing. I currently have an internship with Sundress Publications and did some proofing for Daniel Crocker’s The One Where I Ruin Your Childhood and loved the opportunity to work on another poet’s manuscript. 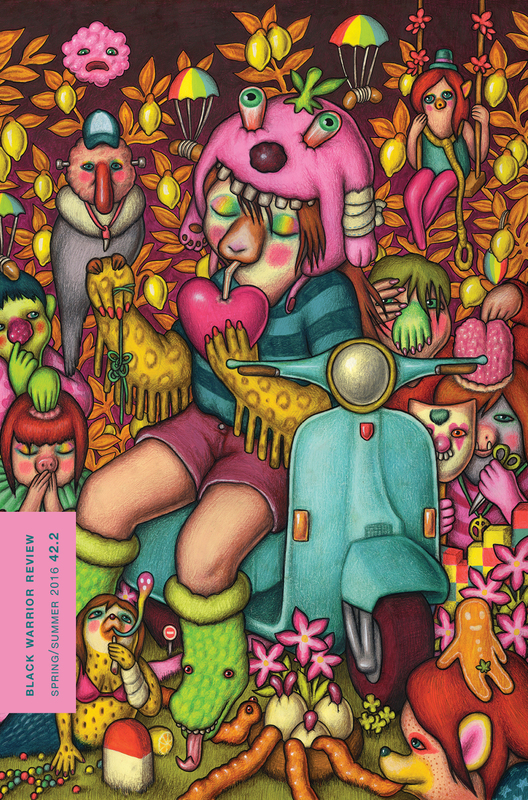 To read Rhiannon Thorne’s work and more, pick up a copy of 42.2 or order a subscription from our online store.